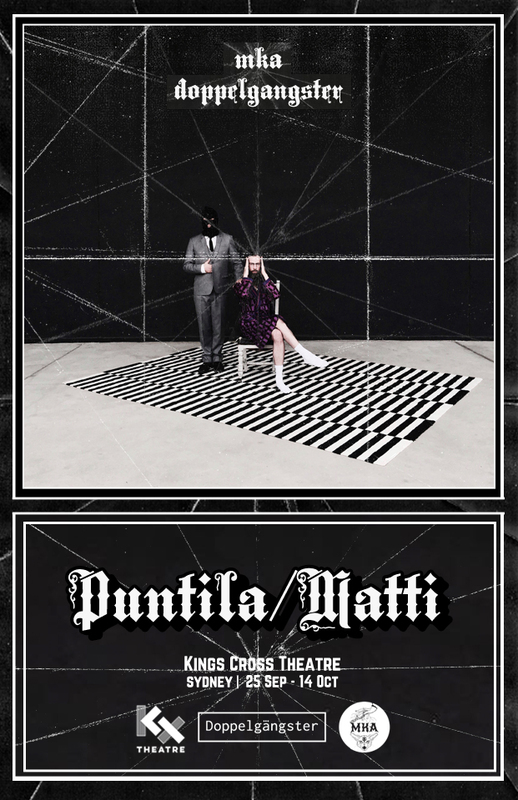 MKA and Doppelgangster’s newest creation, Puntila/Matti, is a riotous 85-minute ride that loosely navigates Bertolt Brecht’s play Mr Puntila and his Man Matti and overlays modern technology, greed and corruption, sarcasm and silliness with whip-smart text and staging. Forget fourth walls, they’ve been completely obliterated in this brave production that at times feels as much like a boxing match as it does a theatre show. Brecht’s theatre relies on the emotional detachment of the audience and this new adaptation of one of his epic dramas certainly nails this. Deliberately hard-going at times, this production is not designed to provide audiences with an emotional journey and cathartic ending. Instead, this show jabs, pokes and at times sledgehammers home the anti-capitalist, anti-corporate greed messages in so many different forms that audiences leave the show with a lot to digest. This collaboration between Melbourne indie theatre mavericks MKA and international innovators Doppelgangster thrives in front of an intimate audience, where the players on stage are close enough to make us appropriately uncomfortable, even throwing in a bit of dreaded audience participation. At all times, we’re incredibly attuned to the staged nature of this production, from Antoinette Barbouttis’ gorgeously anxious stage direction reading between scenes, to verbally calling out an audience member who walked out, right up to being told to leave the theatre at the end of the show. The mastermind behind this madness and the ringmaster on stage, Tobias Manderson-Galvin as Mr Jack Puntila is wickedly charismatic. His energy does not wane for the entirety of the 85 min journey as he spends his time on stage asking audience members to marry him, dousing the stage with a hazer and alternating between the ridiculous and the sinister. The original character in Brecht’s play has a kind of Dr Jekyll/Mr Hyde vibe and Manderson-Galvin absolutely nails this. As Matti, German actor Grace Lauer is captivating. Where Mr Jack Puntila stalks the stage and harasses the audience, Lauer operates with a sort of constant deer in the headlights look on her face, making Manderson-Galvin’s villainous character even more menacing. Lauer’s stagecraft is wonderful to watch, and her grounded and stylised performance balances out the twosome perfectly. The pairing of these two actors is noticeably effective in the moments where Lauer is thrown around by the much bigger Manderson-Galvin. It’s suggestively violent enough to be disturbing, but not enough that we stop watching. Antoinette Barbouttis is simply adorable as the hapless nobody who is tasked with reading out the scene changes and the stage directions from the script and who is so nervous and out of it that she manages to constantly stuff it up. It is actually with this nobody that I felt the most emotional connection within the entire play; her inaudible mumbles and her completely un-theatrical performance create a lot of empathy along the way and I often found myself sneaking a look to the back to see what she was fumbling with next during the action. The design of the show makes use of the Kings Cross Theatre traverse perfectly, with the stark white and black colour scheme on stage being simple, yet effective. The score by Jules Pascoe is particularly brilliant, creating this sort of tongue in cheek, rumbling soundscape that supports the action as this 85-minute show steamrolls its way to its conclusion. This show is another feather in the cap of bAKEHOUSE Theatre’s stellar and challenging 2017 season, that quite honestly has gone from strength to strength this year. Puntila/Matti is not an easy show to sit through. It’s confronting, aggressive and bleak. It’s also hilarious and witty as hell.